Big Time Gaming has taken inspiration from a cult heavy metal album for its latest MegaWays slot game, Holy Diver MegaWays. Based on a medieval fantasy story, it’s a 6 reel title that comes with plenty of extras. As the knight completes his quest, he can open up treasure chests which deliver wild and multiplier extras. Level up to trigger free spins on an expanded game engine that can offer up to 586,971 ways to win! Holy Diver MegaWays is based on a 1983 album by American heavy metal band Dio. It centres on a medieval knight and his quest to reach the Sorcerer’s Castle. On the main reels you’ll see A to 9 symbols plus a quartet of higher paying gems. The best of them is the purple stone which will get you 15 times your total stake if you land 6 on adjacent reels. The number of symbols on each reel changes with each spin. At their maximum in the base game they can reach up 15,120 MegaWays. Underneath the reels you’ll see a knight running along a path. In his way lie treasure chests (which can appear under reels 2 to 6 only). When he reaches 1, he’ll open it and unleash 1 of 4 modifiers. Standard Symbol Bonus feature – 1 of A to 9 symbols is randomly selected. All examples of this symbols on the reel above turn into wilds and a new payout follows. Sword Bonus feature - with his mighty sword, the knight can turn up to 3 reels totally wild. Those wild reels come with multipliers too which can reach up to 7x each. Land the full 7x multiplier on 3 reels and they’re combined to award an enormous 343x boost! Fireball Bonus feature - up to 4 flaming wilds explode on the reels, turning adjacent positions wild too. Gem Symbol Bonus feature – a gemstone or better still multiple gemstones will become wild wherever they are on the reels. Collect gemstone symbols from the chests in the meter to the side of the reels. Once all 4 positions are filled, you’ll be offered the chance to level up or play the Free Spins feature. If you opt for the latter, you’ll be awarded 10 free spins. Any gemstones on reels 2 through 6 are wild. They also come with a 2x or 3x multipliers depending on what level you’ve reached. Below the reels you’ll see diamonds rather than treasure chests. The first 4 times the knight reaches a diamond, 1 extra free spin is added to you total. Once he reaches the fifth diamond, you’ll receive 8 extra free spins. There are no limits to how many free spins you can win. If the reels reach their fully expanded state in the feature, you’ll be playing in a machine that offers 567,789 MegaWays! We must admit, Dio and their hit album Holy Diver, were a mystery to us. Regardless of where the inspiration came from, this slot game version is well worth a look. The range of extras delivers plenty of variety and the medium to high variance delivers enough of a payout punch to keep things interesting. You can win 23,306 times your total stake on every single free spin! The sword and sorcery theme isn’t usually one of our favourites but we enjoyed it here. 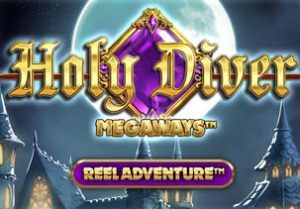 If you like Big Time Gaming’s MegaWays slot games then you’ll want to join the Holy Diver MegaWays on his epic quest. I also recommend you play Primal MegaWays which is my personal favourite from the series.